Photo by Ravi Konjeti: Seattle Office of Emergency Management volunteer Diane Moore provides emergency preparedness tips during the Madison Valley Community Council meeting on Tuesday, Nov. 20. 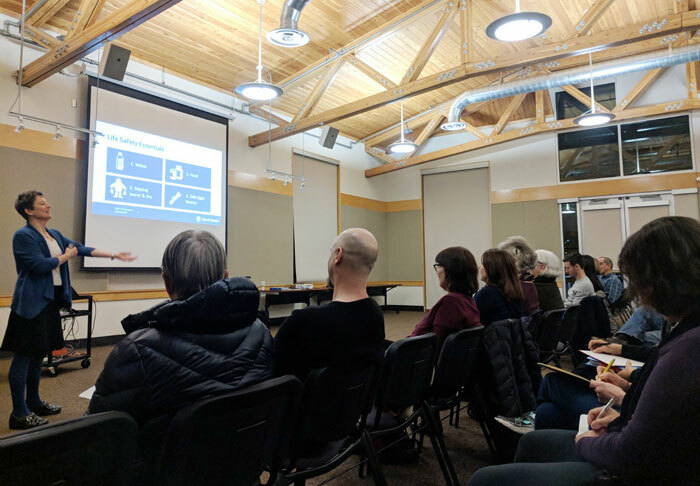 The Madison Valley Community Council held an emergency preparedness informational meeting at The Bush School on Tuesday, Nov. 13. Diane Moore, a volunteer from the Seattle Office of Emergency Management, shared with community members how to prepare for emergencies. Seattle Neighborhoods Actively Prepare (SNAP) is a program aimed at getting communities involved and active in emergency preparation. Moore got involved in the program to get to know the neighborhood. Members from the Madrona and Greenlake communities also attended the presentation. Madison Valley Community Council president Penelope Karovsky mentioned bringing together multiple communities to tackle emergency preparedness. “At every community meeting for the next year, Madison Valley Community Council will cover emergency preparedness,” Karovsky said. Moore kicked off the meeting with the “Life Safety Essentials.” The Life Safety Essentials covers the top-four necessities of water, food, staying warm/dry, and having a safe light source in times of emergency. Moore also presented the “Drop, Cover, Hold” strategy in times of earthquakes. In an earthquake, Moore suggests dropping to the ground, taking cover underneath a desk or table, and holding onto something rigid. Moore organized a quick intersession break to allow people to locate their nearest neighbors. All the residents took the opportunity to organize themselves in clusters, using the opportunity to discuss future plans for emergency preparedness. Community emergency hubs are places where people gather after a disaster to help each other. Moore provided many tips during the presentation while community residents in attendance pitched in with their own suggestions and ideas for combating disasters. Some ideas included holding a block party or creating holiday emergency kits to get more people involved in the community. Moore mentioned other tools, such as Map Your Neighborhood and Seattle Emergency Hubs, to help get started on creating an emergency plan. “Make a plan, even if it’s for a family of one or a family of one with pets,” Moore said. General concern in the community was around city preparedness. Many members asked questions surrounding the city’s actions and infrastructure readiness to avert disasters. The Seattle Office of Emergency Management has two major trainings, SNAP and Disaster Preparedness. More information can be found at seattle.gov/emergency-management/training.